Three more awesome posts are all up on the website, and it’s been another great week to be a woodworker. First, the guitar series rolls on with making the rabbets for the binding. Then, I’ll show you how to make a great looking weathered gray finish. 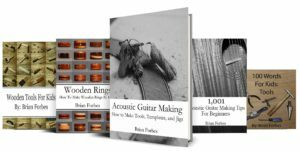 Finally, some ideas on making unique cutting boards and a woodworking gallery. Enjoy. 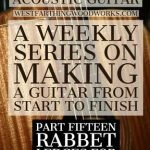 In How to Make an Acoustic Guitar Part 15, I’ll show you the process for making rabbets. These are small ledges or notches around the rim of the guitar body. They are where you will attach the binding and purfling strips, which dress up the overall look of the guitar. You can do this by hand, or with a router. I highly recommend the router method, because it’s faster, cleaner, and you won’t pull your hair out. I also recommend starting out with a simple design that you can accomplish really well, so you don’t add extra worry to your build. As always, it’s better to execute simple really well than barely cross the finish line with a complex design. 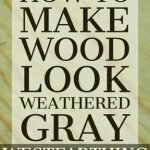 In How to Make Wood Look Weathered Gray, I will show you the absolute simplest method for making wood look old and weathered with the gray coloring that is all the rage right now. It’s so simple that you might fall off your chair when you read it. However, in the majority of cases, simple is the best anyway, so don’t over think it. Use this method, and you can be making a truly great looking weathered look on your pieces the very same day, and without learning any new skills. It’s worth a try, and this is a really fun color that will enhance your rustic pieces. In How to Make Unique Cutting Boards, you will learn several great ways to make your cutting boards stand out from the rest. In a world where everyone sells cutting boards as a first woodworking project, you are dead in the water if you don’t come in with something unique. Anyone looking for cutting boards has already seen dozens that will look just like yours, so you end up competing on price, and that is a losing deal. Instead, use these tips to make a better cutting board with more interest and uniqueness than the rest. Even a new woodworker can win the unique game. It’s all about what you bring to market, not how long you have been going to the market. In the Weekly Woodworking Gallery, there are 21 new pictures from the site for you to enjoy. These are a lot of fun to look through, and showcase many different topics from the site. 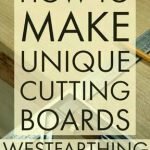 If you have any questions about my awesome week, and all the cool stuff happening at Westfarthing Woodworks, please leave a comment and I will be glad to answer them. Happy building.